Having been to Capri twice, I’m surprised that the majority of people tend to pay the beautiful island a fleeting visit, arriving just before midday and fleeing on a late afternoon ferry. There’s so much more to see on the island than the Blue Grotto and the Piazzetta in Capri town! Here are my top tips and recommendations for an extended trip to my favourite Italian Isle. One of the most iconic sites of Capri, it’s impossible to visit the island without taking a boat over to the Blue Grotto. Hop aboard a boat in Marina Grande, either just to the Blue Grotto or a half-day trip to the Blue Grotto and continuing around the entire island. I chose to go around the whole island, taking in the lighthouse, a couple of smaller grottos and of course the Faraglioni. 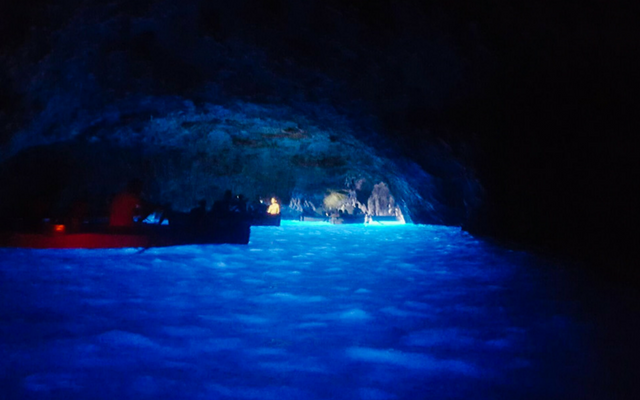 For the Blue Grotto, you’ll need to be transferred to a wooden rowboat so your able skipper can navigate through the entrance to the grotto – be sure to lay as flat as possible as the entrance is barely a meter high! Once inside, you’ll see the grotto lit up by a beautiful azure blue light, while the boatmen sing old sailor songs. It really is something special. I continued around the island and one of the highlights was seeing the Faraglioni, three huge rocks jutting out of the water. 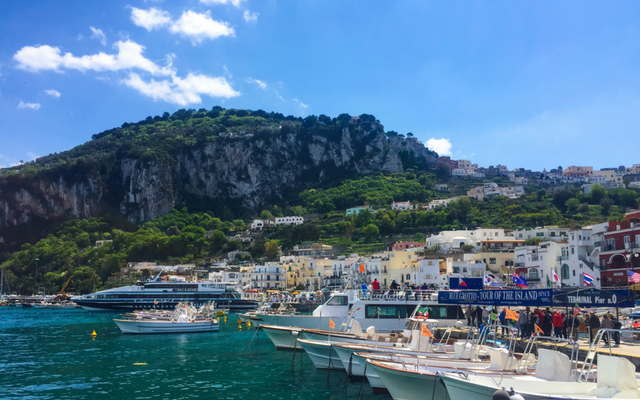 They’re an iconic emblem of Capri and this is the best way to see them so I highly recommend taking the half day boat tour. Capri Town is unsurprisingly the epicentre of Capri island. As soon as you step off the boat, you’re whisked by funicular train up to Capri Town. The Piazzetta is the heart of Capri Town, with four bars on each side of the square – ideal for sipping a limoncello and people watching. The town has a very laid back vibe so it’s best to take it easy and just have a wander down the little lanes and enjoy it at leisure. I’ll cover where to eat and drink a little later in this post but the town is great for shopping. Fashionistas must take a stroll down Via Camerelle to window shop every luxury brand from Prada to Gucci, Chanel is opening very soon right across the street from the Grand Hotel Quisisana. Aside from food and fashion, there are two lovely hiking trails which start in Capri Town. There’s a lovely hike up to Villa Jovis which sits atop Capri’s second highest peak, Monte Tiberio. The second hike is slightly more leisurely, taking you to the Arco Naturale, a natural arch formed by the collapse of a grotto which dates back to the Palaeolithic age. Both hikes start at the same spot. Next to Piccolo Bar, head down a tiny little road which is no more than an alley called Via Le Botteghe. Keep following the road until you see signs for both Villa Jovis and the Arco Naturale, pick your route depending on how adventurous you’re feeling! There are some great little restaurants along the Arco Naturale route, as an FYI. Anacapri feels like the real Capri, no glitz or glam, no celebrities and much fewer tourists, you get a feel for real life on the island. Full of pretty little lanes and piazzas decorated with bright geraniums and bougainvillaea, it’s so picturesque it barely feels real. 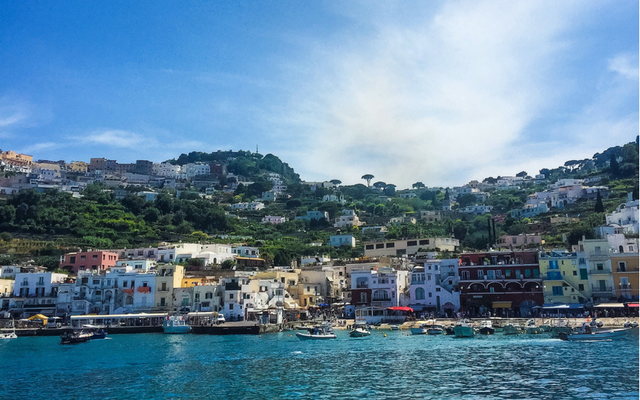 It’s only a short 15-minute bus ride from Capri Town but feels like a world away. Those day trippers are really missing out! The bus shudders to a stop in Piazza Vittoria, in between the chair lift for Monte Solaro and the main street in Anacapri. Getting a chair lift to the top of Capri’s highest peak is one of my favourite things to do on the island. It takes about 12 minutes to slowly make your way to the top of Monte Solaro, enough time to take in incredible panoramic views of the island. 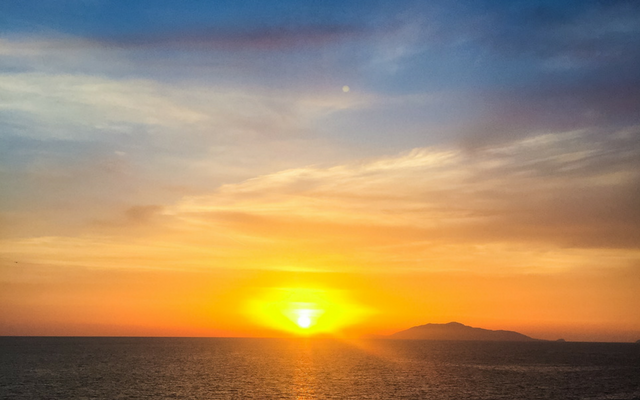 At the top, you’re rewarded with beautiful views across the Bay of Naples, just blue skies meeting blue seas. There’s a shop at the top but I recommend taking your own picnic of treats with you. You can either return via chairlift or by hiking down the mountain. I’ve done both and thoroughly recommend the hike down – for one, gravity is working with you! It’s not an arduous journey, just watch out for goats on your way down. Once you’re back in Piazza Vittoria, head across the road to Via Giuseppe, the main street in Anacapri. This is a beautiful little bougainvillea-lined street full of shops and restaurants. Last time I was taking a stroll down, I made friends with an old Nonno who introduced me to his wife and sold me a pair of her hand-knitted baby booties. About halfway down the lane, you’ll see signs to Chiesa Monulentale di San Michele. Follow them and you’ll find the most incredible church. The baroque church was completed in 1719 and while it may look simple on the outside, the inside houses one of Capri’s architectural treasures. Ceramic artist Leonardo Chiaiese painted the majolica tiled floor with a scene showing the expulsion of Adam and Eve from the Garden of Eden. The detail is incredible, best admired up close on the ground floor and in its entirety from the organ loft where the colours and scene really come to life. From Viale Tommaso de Tommaso bus stop in Anacapri, you can continue by bus to Faro, the southernmost tip of the island. Home to Capri’s lighthouse, the second tallest in Italy, this little spot in drenched in sunshine from dawn til dusk. No wonder it’s a favourite spot for the locals, both for sunbathing at the beach as well as enjoying an epic sunset. There are a number of paid-for beach clubs on the island but the Lido del Faro is free, perfect! Beaches on Capri tend to be rocky but the beach at Faro has sun decks nestled between the rocks, a beach club, restaurant and snack bar. On Sunday, half the island descends onto Faro for a sunset beach party. There are three beach bars servicing cocktails and it’s the perfect spot to watch the sun set across the crystal clear waters. When it comes to dining, you are spoilt for choice. Most of my favourite restaurants on the island are located in Capri Town, where you may or may not bump into one of the celebrities that love to visit Capri during the summer months. La Capannina is a Capri institution. It dates back to the 1930s and everyone from Jackie O to Mariah Carey has passed through their doors – the walls are adorned with pictures of politicians, singers and royalty who have dined at the restaurant. During busy months, the beautiful conservatory is the place to be, decked out with flowers it’s a stunning space. I enjoyed a modest ravioli with parmesan topped asparagus as a side and regret not ordering more! Aurora is one of those places on the island, where you go to be seen. One of the top eateries on the island, it has a beautiful front terrace which is always lively as well as an expansive yet intimate dining space inside. Candle-lit tables with starched tablecloths and attentive waiters in black and white uniforms, this is the place to go for a special meal on the island. Owned by the D’Allesio family, the cuisine is traditional Caprese with a touch of Neapolitan flair. I started with a very green and very fresh minestrone soup followed by the thinnest, lightest margarita pizza I have ever had in my life, the base was paper thin but full of flavour. I didn’t want this gastronomic feast to end so of course, I found a little room for dessert, a delicious rhum baba was the perfect way to end this incredible meal. Just a couple of doors down from Aurora is Restaurant D’Amore. We grabbed a seat at the bright, pretty terrace to grab a quick bite before hopping on the ferry back to Naples and it’s probably one of the best impulse decisions I’ve made. The restaurant is a mix of old and new. The name itself is new, formerly known as the Ristorante Sollievo, and the place has had a beautiful, contemporary makeover. I had a delicious and generous portion of gnocchi alla Sorrentina, which was very welcome after the tiny portion I received at La Capannina. I finished my meal with the most exquisitely presented Crème Brulee. Even a month on, I still think about my meal at Restaurant D’Amore. Villa Verde, like Aurora, came highly recommended and is known as one of the best eateries on the island – this was confirmed by the group of handsome Italians at the next table who inevitably started chatting to us. Despite the reputation, this was my least favourite place to eat. As a vegetarian, I’m used to having a reduced menu choice compared to my meat-eating pals but this has never really been a problem for me in Italy, I find it one of the easiest places to be vegetarian as everywhere does a margarita and a spaghetti Pomodoro as an absolute minimum. I opted for the latter as it was one of the few veggie-friendly options and it was awful. It was just spaghetti with chunks of very strong tomatoes chopped and thrown together, I didn’t get a hint of garlic, basil or any other seasoning. Luckily the tiramisu and multiple limoncellos saved this otherwise disappointing meal. 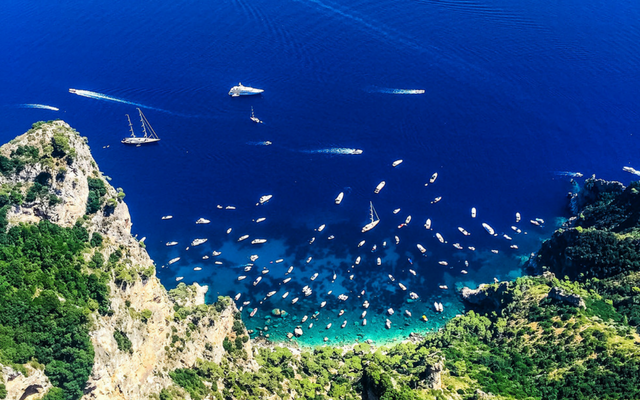 You’d be forgiven for assuming the nightlife in Capri was wild – ostentatious clubs rivalling the Just Cavalli club in Milan perhaps or perhaps super sleek hotel bars channelling the Armani hotel. There are in fact only two clubs on the entire island, the infamous yet unassuming Taverna Anema e Core and a nightclub I can’t quite remember the name of…despite two visits in two years. Located in the centre of Capri Town just a hop and a skip from Villa Verde lies the Taverna and its infamous stage show. The first time I visited the Taverna, I was ushered through the unmarked wooden doors by some rather cute Italian boys who promised it’s the best spot in town. What I encountered was a live band playing traditional Latin and Italian songs which everyone (bar me) knew all the words to. Everyone was in high spirits, the drinks flowed freely and it was all very confusing. Hard to imagine Naomi Campbell or Beyonce and Jay Z in the Taverna but stranger things have happened. Like the end of the night when legendary owner Guido, a 90-something Italian Nonno, jumps on a table and starts to strip down to his white pants… to much applause. When I visit this year, I meet Guido himself. The charmer kissed my hand and sang me Italian love songs, the charmer. The second time around, knowing what I was in for, it was a super fun night and I can see why the Taverna is the island’s hot spot. Where to stay:Inevitably, there are a plethora of hotels to choose from in Capri. For me, location was super important. 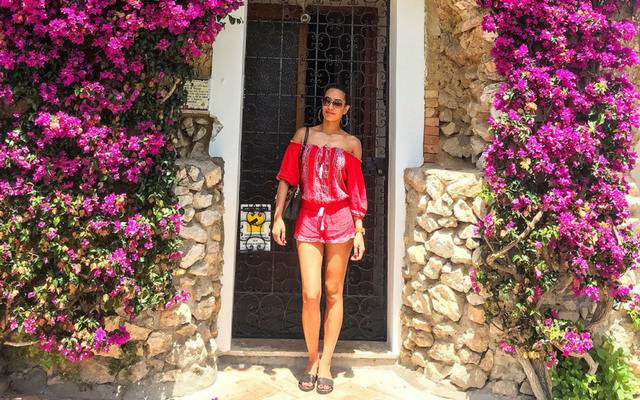 Having visited the island last year, I knew that I wanted to stay in Capri Town for ease, accessibility and of course to be near the good food! For me, the obvious choice was the Grand Hotel Quisisana – arguably the finest hotel in Capri. It was opened in 1845 and occupies an enviable location just off Via Camerelle. The neoclassical building is so grand and beautiful, the staff could not do more to help you and the breakfast buffet is to die for. I loved the beautiful pool area which looks our across the sea – this is a huge bonus owing to the lack of “proper” beaches on Capri. Read my full review of Grand Hotel Quisisana in my separate post, coming soon.